Battery Backed Up Clock: Yes. Model A used square varta batteries, Model B & C uses "barrel" shaped batteries. The A2000 was launched in 1986 and was aimed at the professional productivity market. The original version was designed in germany, and was actually based on the the A1000, not the A500. 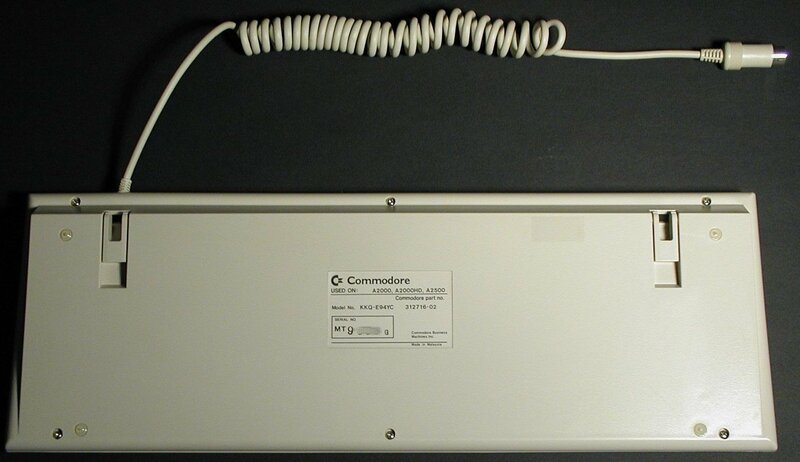 However, later that year Commodore US redesigned it, and the new model (referred to as A2000-B) was indeed the high-end version of the A500 that the A2000 is known as. There are probably more variations and revisions of this model than any other Amiga. Not only were at least 15 separate motherboard revisions produced, the model spans 3 versions of Kickstart and two chipset generations. Several sub-models (A1500, A2000HD and A2500) were also produced. It is usually possible to tell the difference between the OCS and ECS versions of the A2000 by the colour of the front panel LEDs. The OCS versions have a red power LED and a green HD LED, while the ECS versions have a green power LED and an orange HD LED. 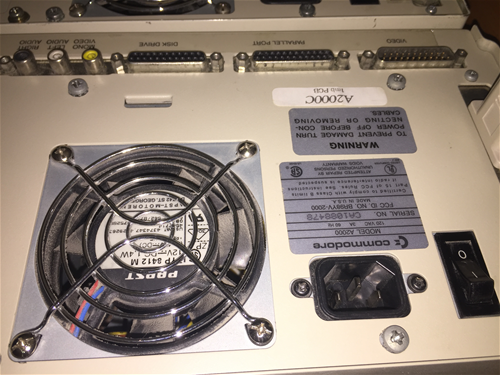 The easiest way to separate an A2000-A (the A1000-based german version) from the later, A500-based models, is to see if there is a composite connector beside the RCA sound connectors at the back. If there is none, it's the original version. 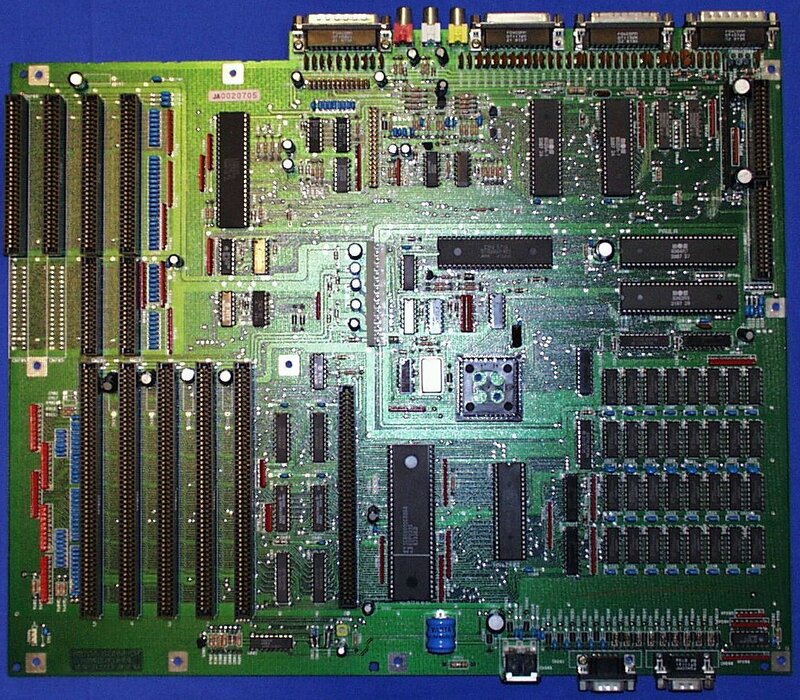 All Amiga 2000s were sold with 1MB of RAM, but how this was implemented varied over motherboard revisions. 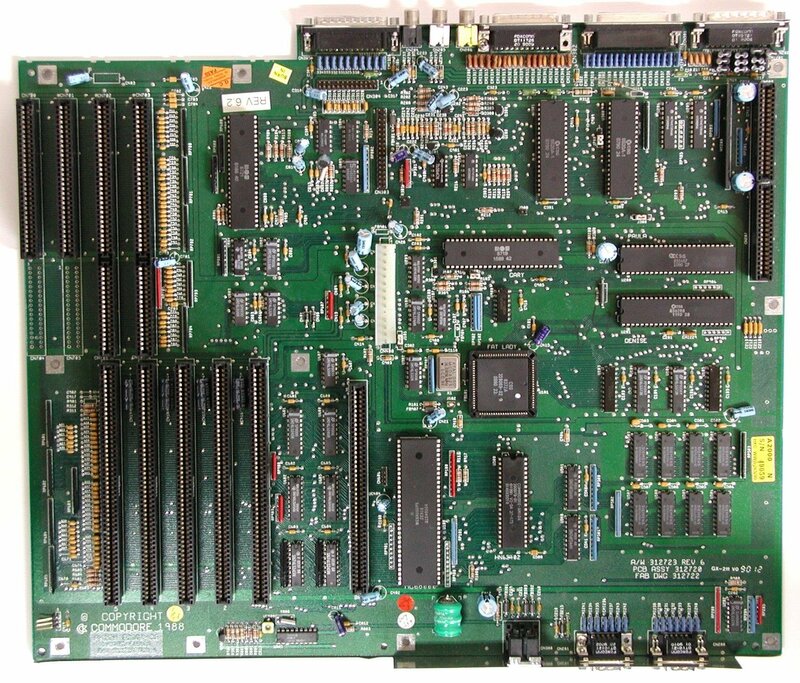 The German (model A) designs have 512K chip RAM on the motherboard and 512K Fast RAM on an expansion card fitted to the CPU Fast slot. 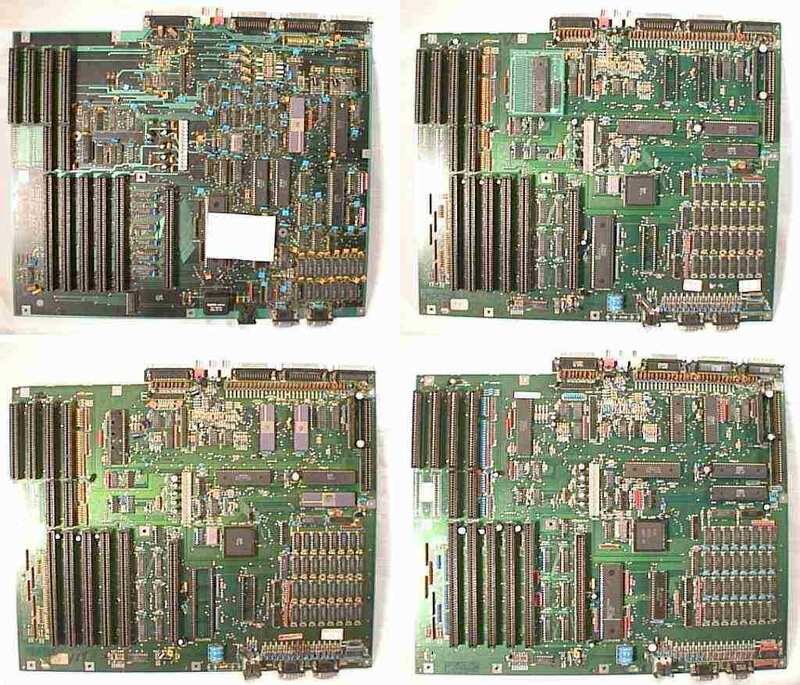 The US 4.x (model B) motherboards had 1MB of RAM soldered to the motherboard with 512K configured as CHIP RAM and 512K as Fast. 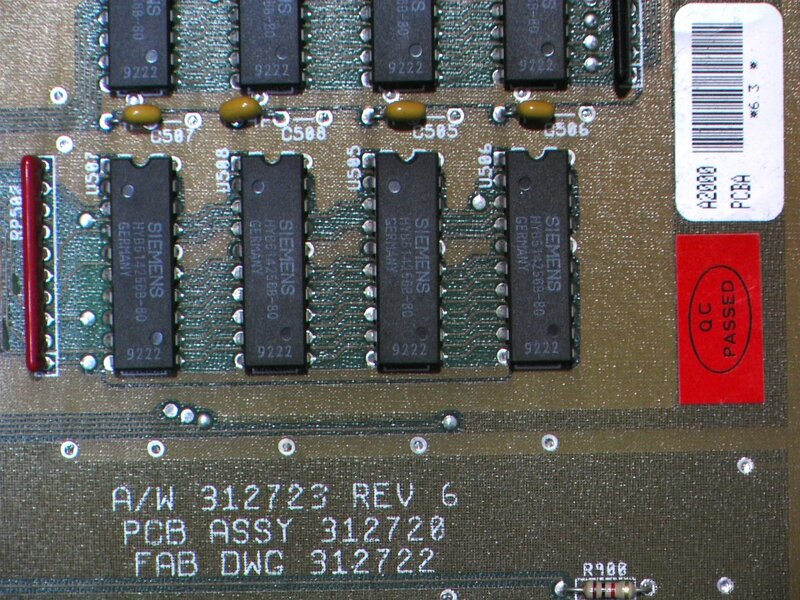 The Fast RAM on these models can be reconfigured into Chip RAM by upgrading the Agnus and cutting some connections). Rev 6.x ("model C") boards have 1MB of RAM soldered to the motherboard, all of which is configured as CHIP RAM. Early A2000's were fitted with a Buster Tower which sits in the buster socket. This is because the buster was faulty, it was missing a term signal in one of the backplane buffer control signals. The tower contained an additional PAL which fixed this problem. "The A2000 Model A was a german design, like an A1000 in a different box. 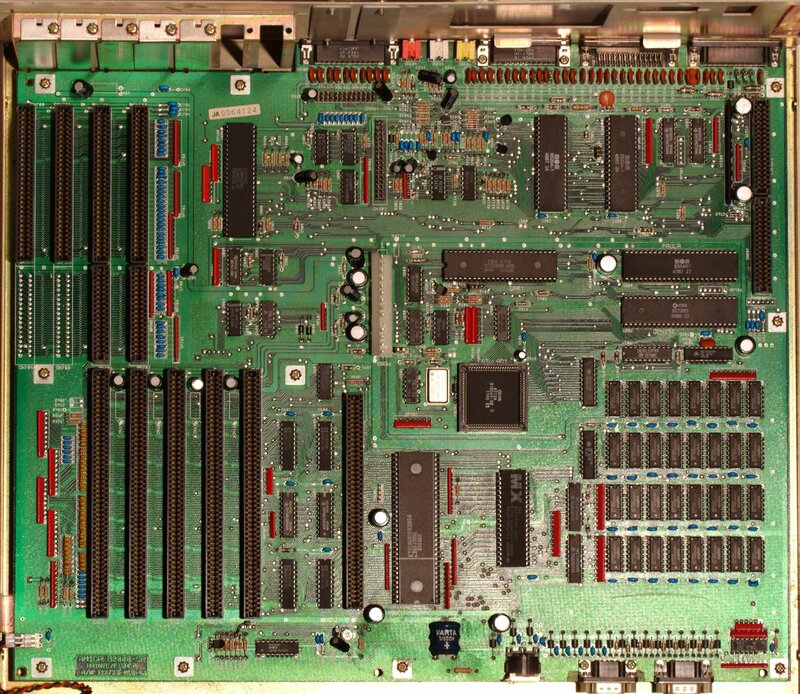 512K CHIP and non-standard processor and video slots. Yes, The orginal A2000 was designed in Germany. 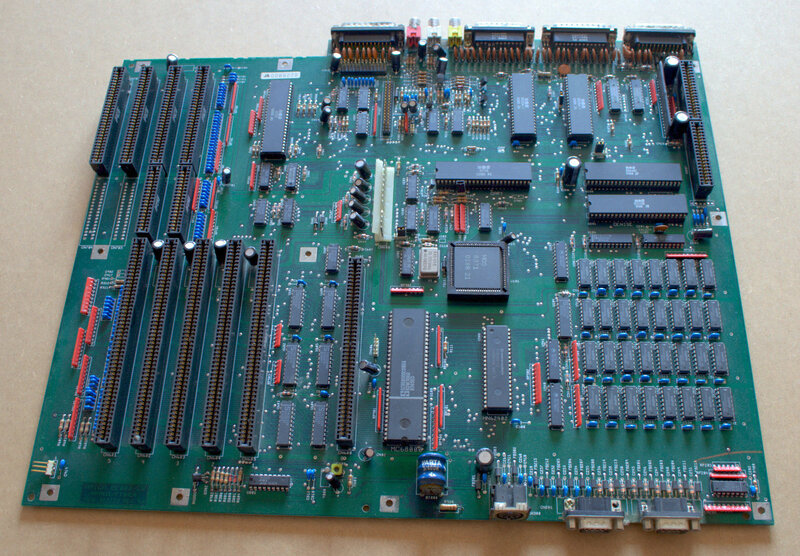 It was based on an integration of the A1000 motherboard design and the example Zorro II backplane from "Schematics and Expansion Specifications", the A1000 hardware manual. It used the thin Agnus, which handled only 512K of DRAM. They added a "Genlock" slot, which was essentially just the 23-bit video signals on an internal connector, and the "MMU" slot, which was essentially just the A1000 external edge connector on an internal slot. 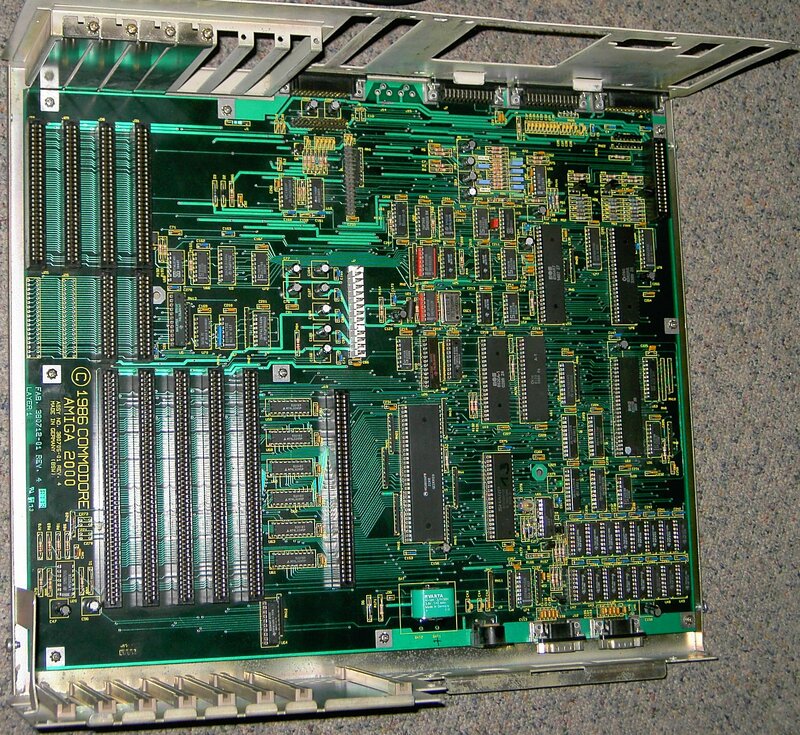 The machine shipped with 512K of Fast RAM in this slot, though the case was slow and had some reliability problems. About 60,000 of these machines were made, so I've heard. This was the original A2000-CR (Cost Reduced) that I designed. 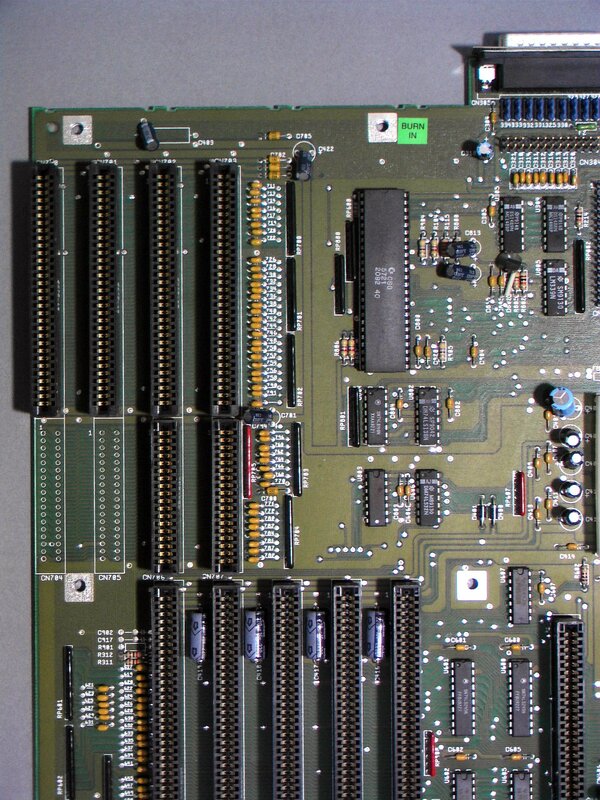 I took the A500 chip set and integrated most of the control logic for the expansion bus into a gate array called Buster (the original thin Buster). 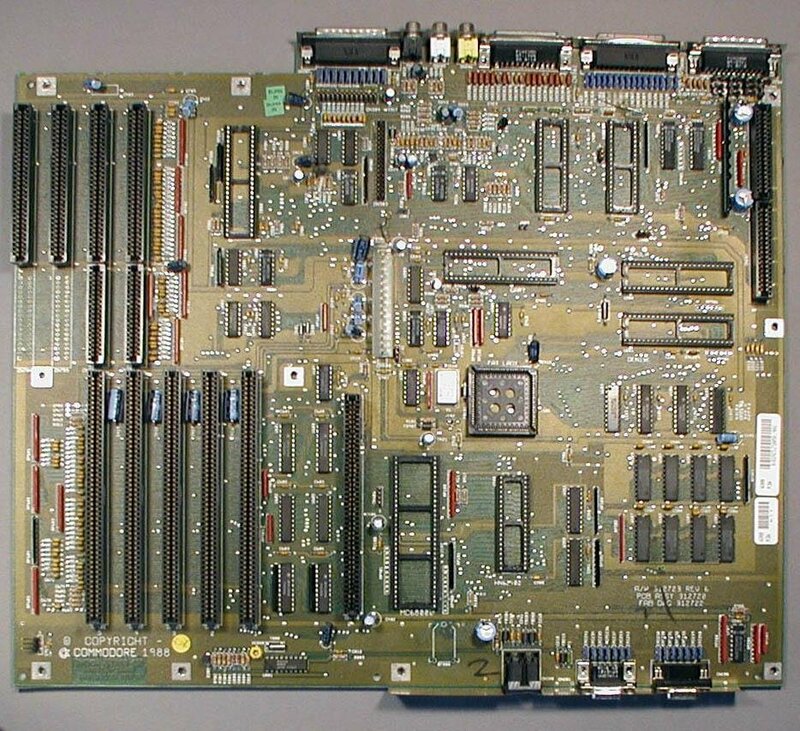 This board was code-named the "B2000", not out of any special letter-sequencing, but because it was made from some A500 parts -- the A500's code-name was the "B-52". About 200 pre-production B2000s were released, as "Dealer Demo" units, never meant to be sold. That's labelled Rev 3.9, of course some dealers sold them, since the A2000 was hot. These may have problems with CPU slot devices since, like the orginal A2000, there was no additional buffering on the clocks that drove that slot (and timing is very critical in many CPU slot applications). The Rev 4 A2000 was around most of the system's life. This was really just the Rev 3.9 with all the finalized changes. Extra buffering splits Agnus clocks between internal, expansion, and CPU slots. 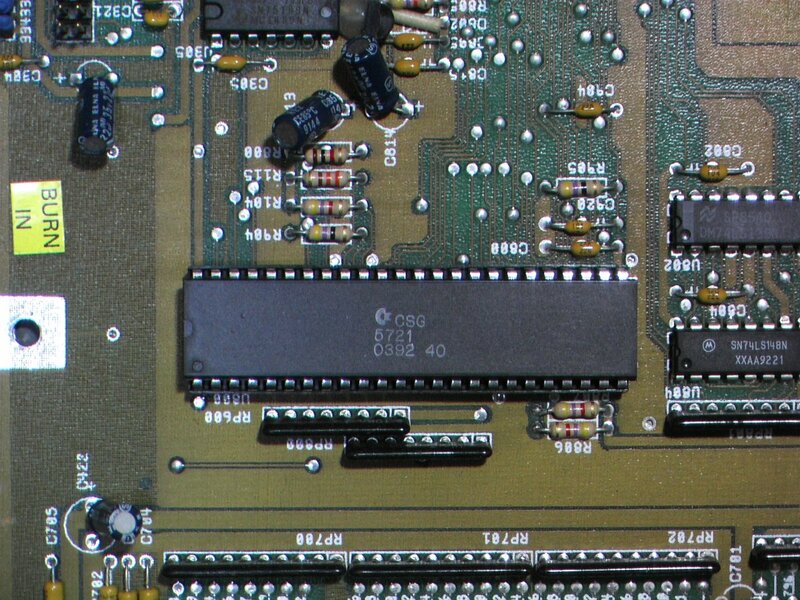 Rev 4.1 immediately corrected one missing signal on the secondary video slot (no plain Rev 4.0 boards were released). Rev 4.2 was some kind of production fix, I think it removed some overzealous FCC hacks, like the extra filter capacitors on the keyboard connector. Rev 4.3 tweaked a few pullup resistor values, to adjust for differences in the new CSG-made Gary chip (a full custom part) versus the Toshiba-made Gary chip (a gate array). 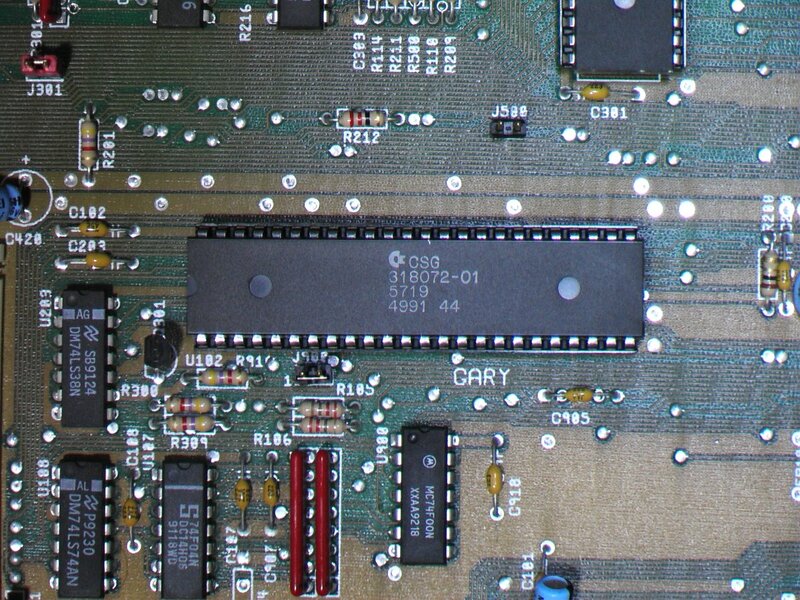 After some 150,000 or so A500/A2000s, the CSG Gary was phased in. Rev 4.4 I believe made some changes to filtering of the TICK line, to account for some new power supplies that had been particularly noisy on that line. Rev 4.5 increases the value of the pullup resistor on the BAS* line of the expansion bus; there was a strange problem in conjunction with expansion bus DMA turnaround (what happens after a DMA device gives the bus back), BAS*, certain vendors of the 74ALS245 buffer that sits between BAS* and the local bus's AS*, and accelerator cards that could cause crashes. Add a 1K or so pullup to pins 11 and 20 of U605 on pre-4.5 boards to fix this problem (this was the only severe problem addressed by any subrevision). The Rev 6 A2000 was never called the A2000C, except maybe by geeks on usenet :-). 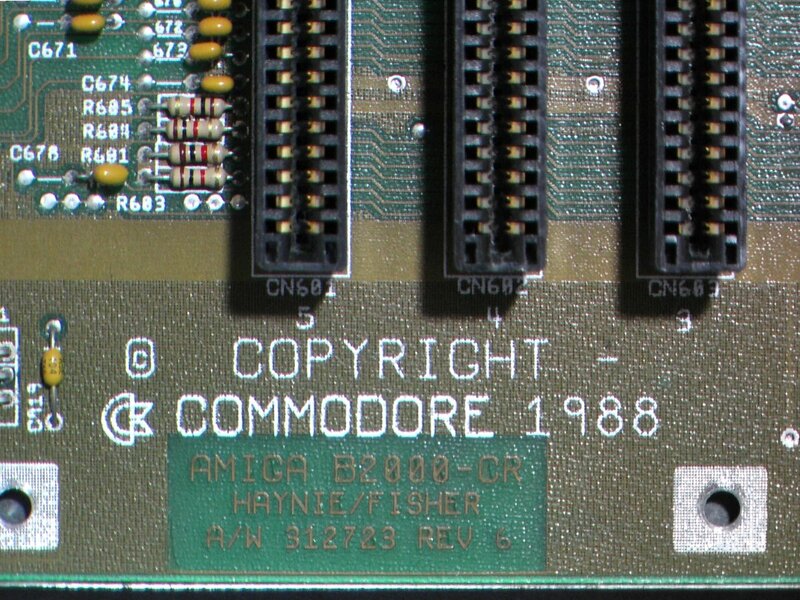 07/05/2018 - BBoAH user Christian Stich has discovered an Amiga 2000 - with a A2000C sticker on the back (see photo section). 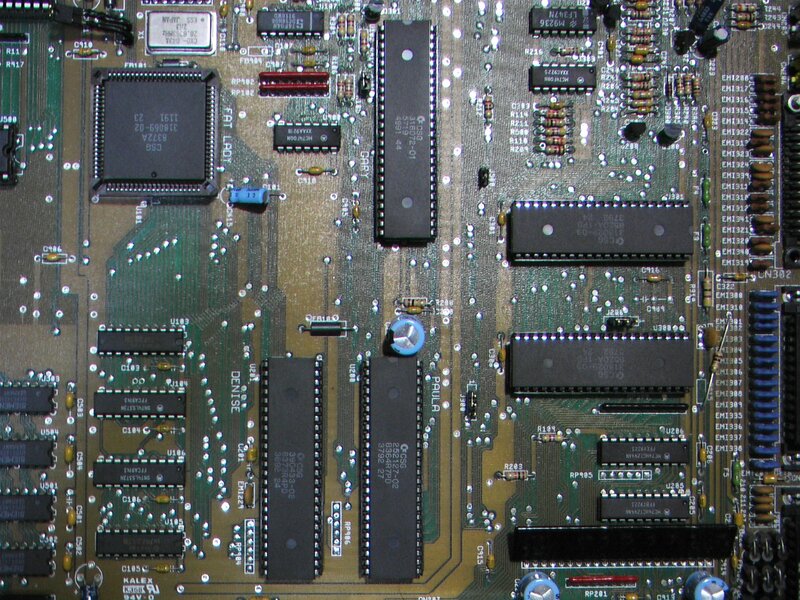 The machine is a rev 6.4 motherboard with the VBB 8375 Agnus (the version that is pin compatible to the 8372A, other than the Test/NTSC/PAL pin). 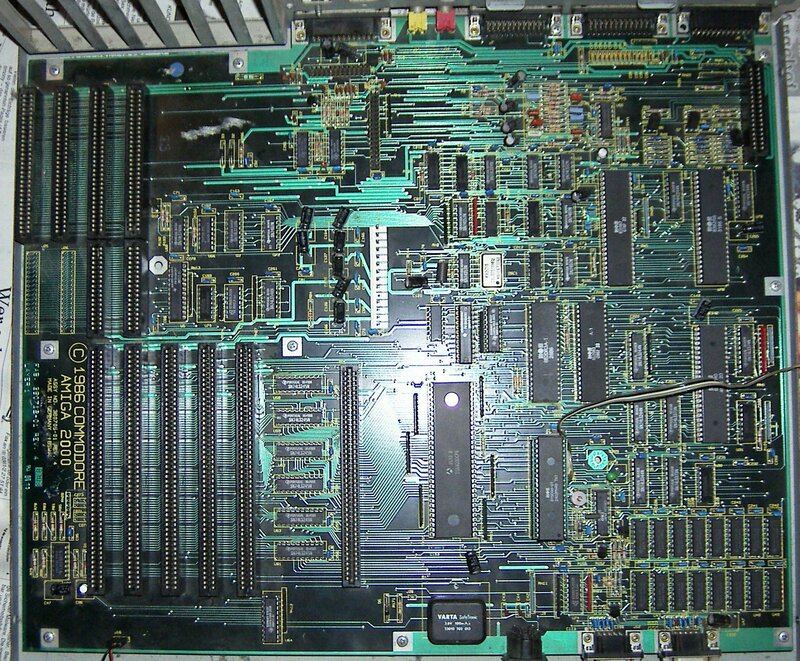 The Rev 6 A2000 changed the DRAM array from 256K x 1 parts to 256K x 4 parts. Some layout and FCC changes were made, I don't know just what, I was kind of out of the picture at the time (Rev 5 was just Rev 4.5 with the DRAM changes, nothing else. Rev 6 did more, I wasn't really involved). 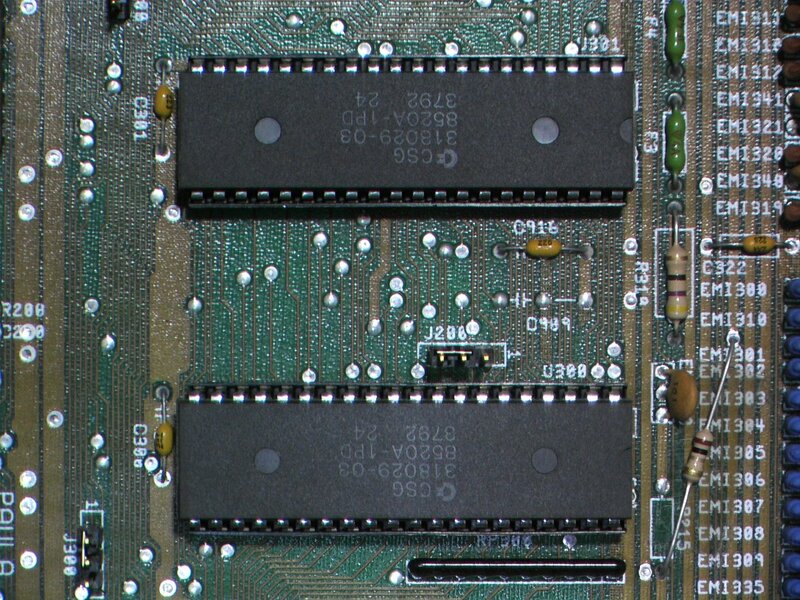 The original Rev 6 board has some noise problems on the expansion bus, possibly due to a new production of 68000s from Motorola that happed to be used at the same time. Rev 6 also had some extra noise on its time-of-day clock. Rev 6.1 corrects the clock noise, Rev 6.2 addresses the expansion bus noise. While there are many Amiga 2000s in the world, the Rev 5 is extremely rare. As far as I know, only about five boards were made. The purpose of the Rev 5 board was simply to add higher density memory to the Amiga 2000. The original design used sixteen memories for a bank of memory, this design used four (there are two banks). 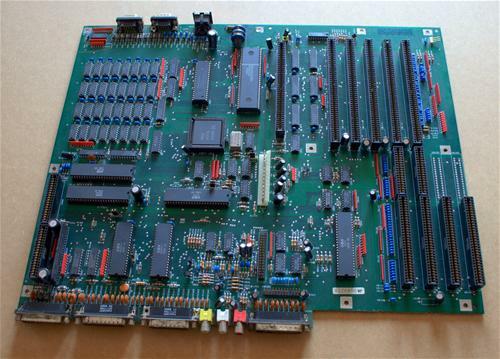 This was the last Amiga 2000 motherboard I had all that much to do with.. Apparently a note from Bryce Nesbitt. 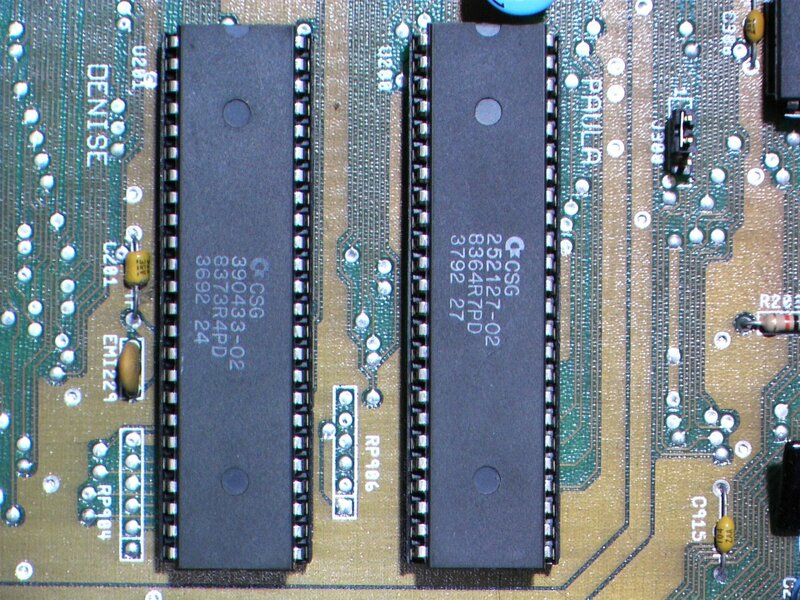 The "1 <->31 swap" was for pin numbers on the ROM. 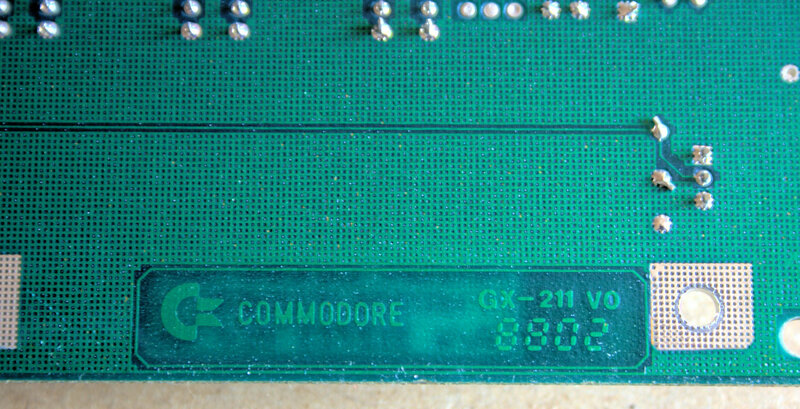 Commodore has apparently received bogus information about which pin would supply the next address line, as these ROMs grew from 256K to 512K. 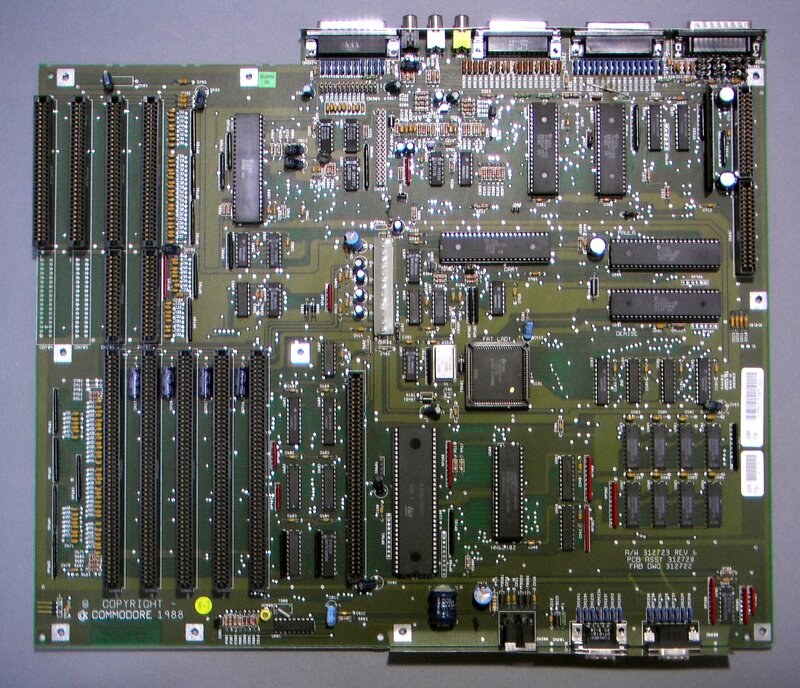 The German A2000 and some early A500s had this problem, as the note says. The correct information prevented this issue in US Amiga 2000s. 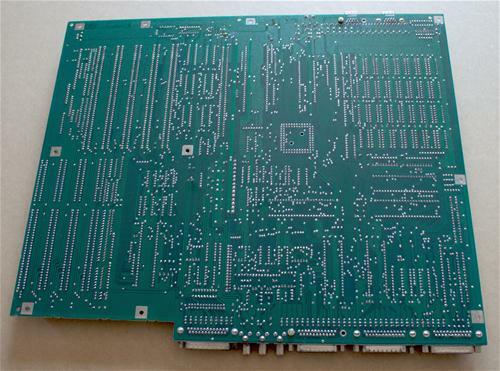 The board on the top right is a US "B2000" Rev 3.8 (preproduction) Amiga 2000. 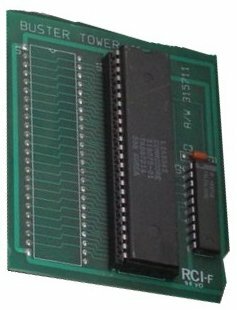 This has been stripped of its ROM and its 8520s, but it does include the Buster "Tower". That tower's my fault, lemme 'splain. 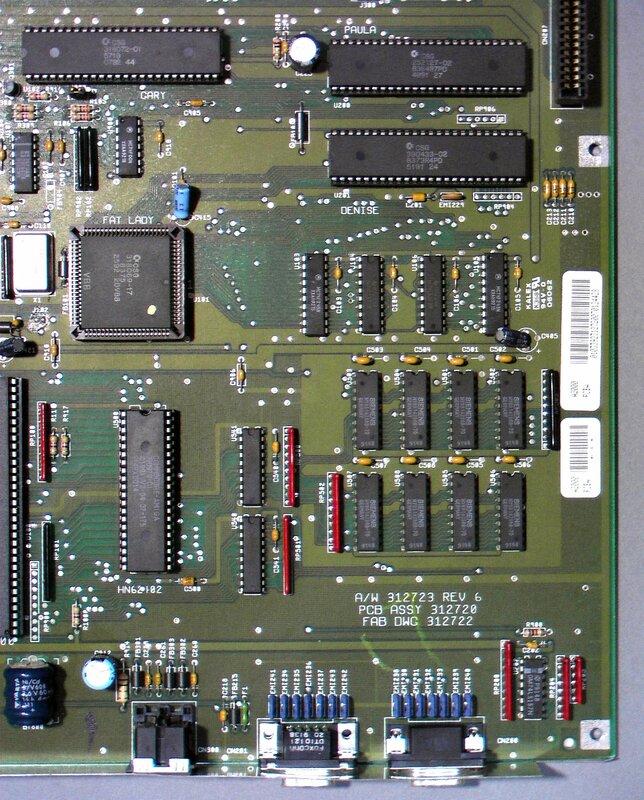 When I took over the Amiga 2000 project, in the fall of 1986 (well, after the shock wore off), I set out to implement the first "Buster" (Bus controller) chip. This did with the expansion logic much of what Gary and the Fat Agnus did to the original Amiga 1000 logic: shrunk it in price and in size. 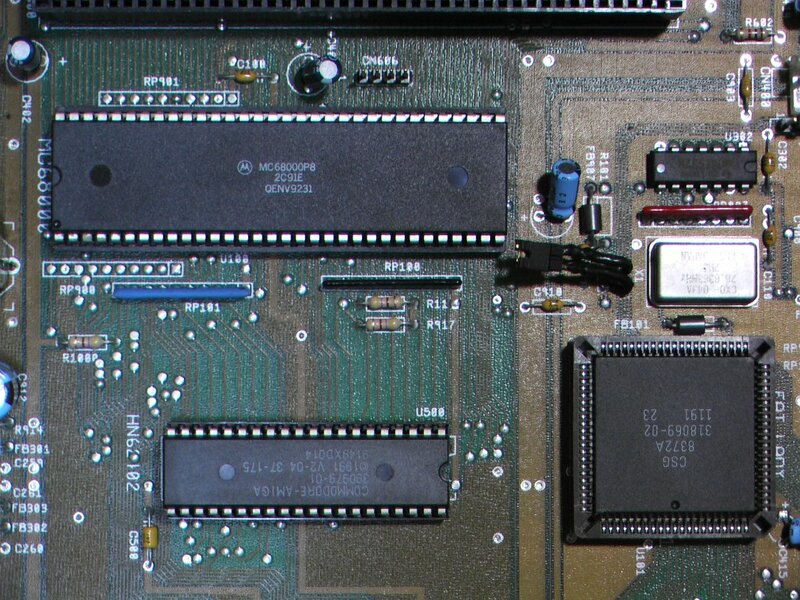 Since I was, in essence, copying the German design (they _do_ look similar, eh), I took the PAL equations from the Amiga 2000 on the left as my basis for the Buster chip. Whoops. There was a bug in the German PALs. There are a set of buffers between the A2000's local bus (directly on the 68000) and the Zorro bus. When a Zorro bus master talks to a Zorro bus target, these buffers are supposed to point away from Zorro, toward the local bus. 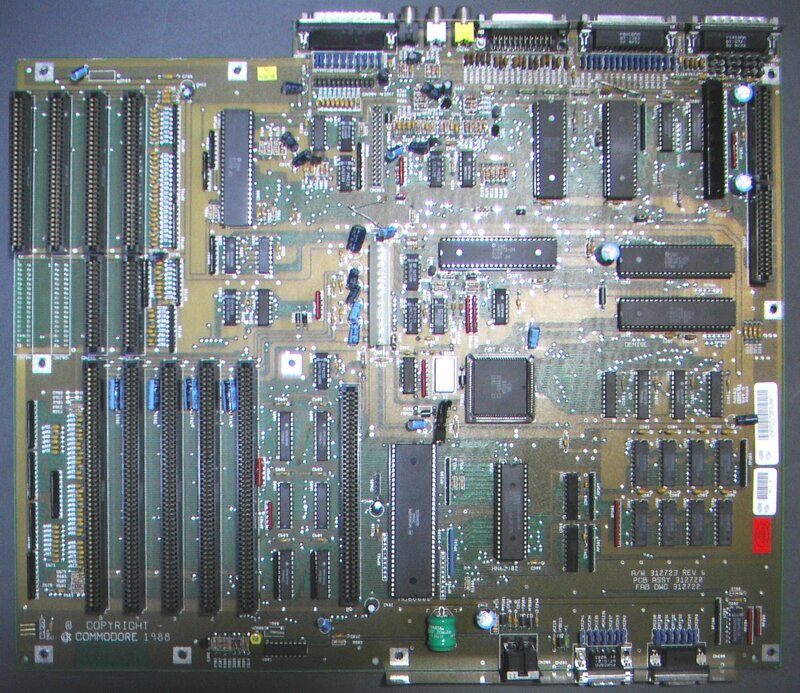 During pre-production testing at the Commodore plant in Taiwan, I discovered that wasn't the case with the German A2000, or my shiny new Buster chip -- motherboard buffers fought with anything driving the expansion bus in this case. Whoops. In Germany, they fixed it with a new PAL. The Buster "tower" fixed it here, until a corrected Buster chip could be produced. 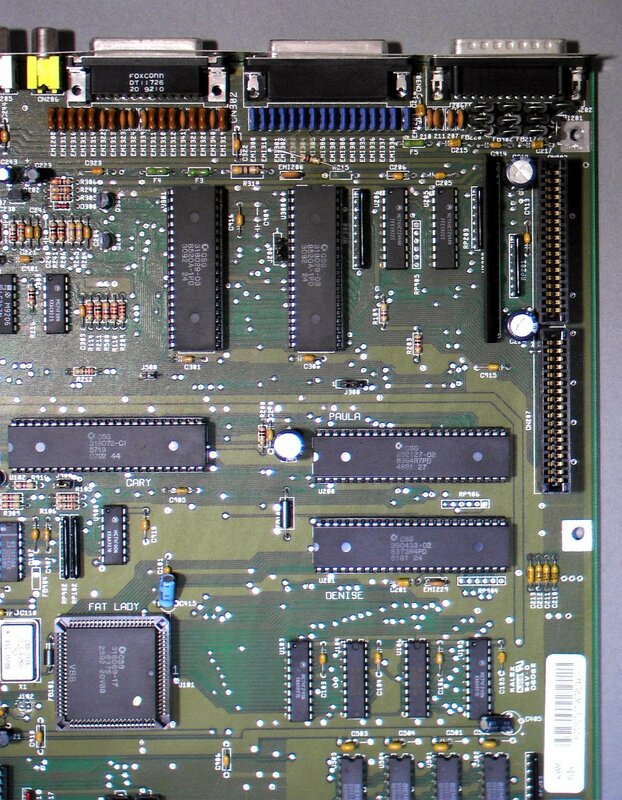 The board on the bottom left is another "B2000" Rev 3.8 board. 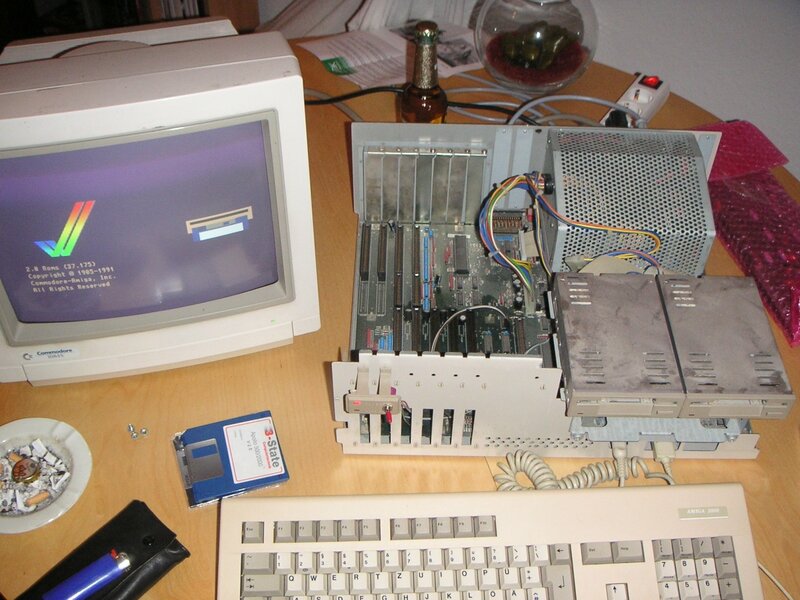 This one still has those precious 8520s, but it has been stripped of the 68000, the ROM, and any sort of Buster chip. 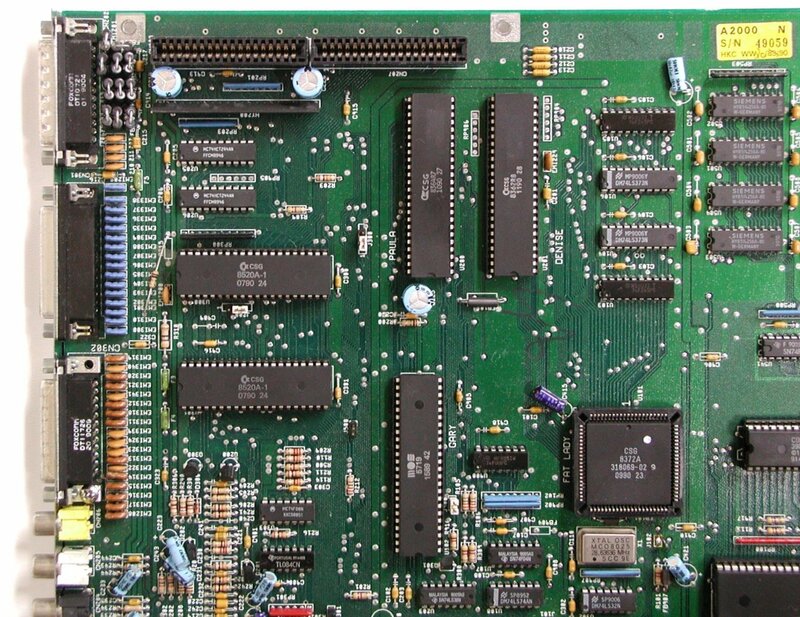 All A2000 Busters do work in all motherboards, you don't need a towered Buster for these older boards. However, the Rev 3.8 board was questionable with CPU cards -- the primary reasons for Rev 4 were FCC issues and beefing up the whole coprocessor mechanism with additional buffers. 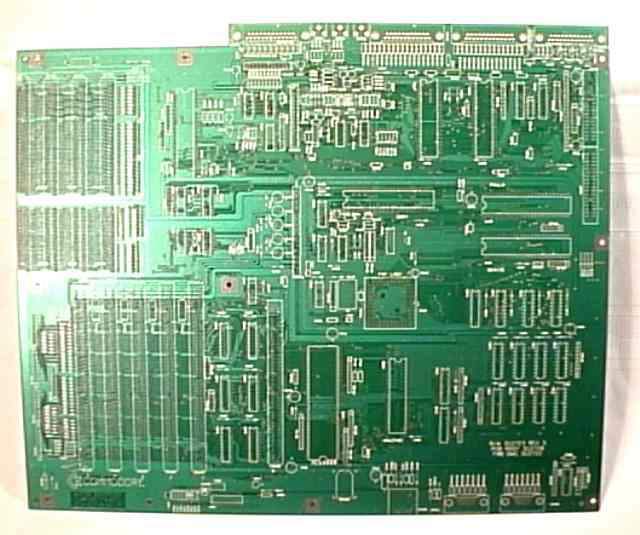 These setting come out of the manual for an Amiga 2000 Revision 4.x and is compliant with Rev 6.x Amiga 2000 boards as well. J101 This jumper determines the high order address bit for Fat Agnus. In it's normal position, the high-order bit is A23; in it's other position, this bit is A19. The current Fat Agnus chip requires the A23 signal for proper management of the memory at $C00000. Future Fat Agnus chips may do things differently; this keeps the current board compatible with simple enhancements. J200 This jumper determines the time base used for the 50/60Hz CIA timer chip. In the normal posistion, the 50/60 TICK clock, based on AC line frequency, is used as a time base. In the alternate position, the verticle sync pulse from the video section is used. The system will not operate properly without one of these clocks. J301 This jumper is closed to add a second internal floppy drive, open to leave the second floppy out of the main unit box. The Amiga expects an ID bit stream from each floppy drive; this lets it determine the drive type. External floppies have this ID circuitry on board, but as it's not an industry standard capability, it has to be implemented on the A2000 motherboard to save cost on internal drives. Leaving the jumper open prevents the Amiga from seeing the ID sequence. 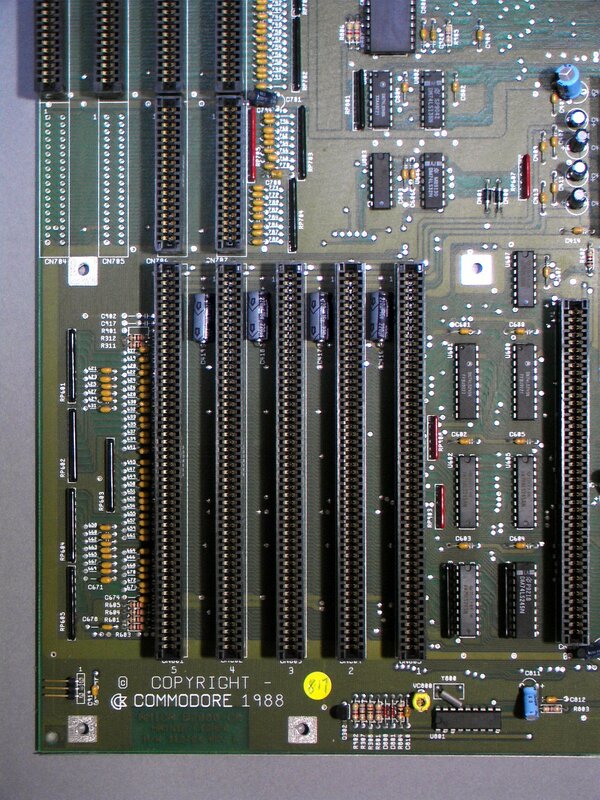 J500 This jumper is used to enable the 512k of RAM at $C00000 and the real-time clock. It is normally closed; opening it will disable both this extra RAM and the real-time clock. Page contributors: Christian Buker, Christian Stich, Dave Haynie, Franck BARNIER, Gerhard Kupka, Greg Donner, Greg Scott (National Amiga), Holger Hesselbarth, Joe Thomas, RiWa & Friends, Sylvio Kurze, Takahasi Kasiko.